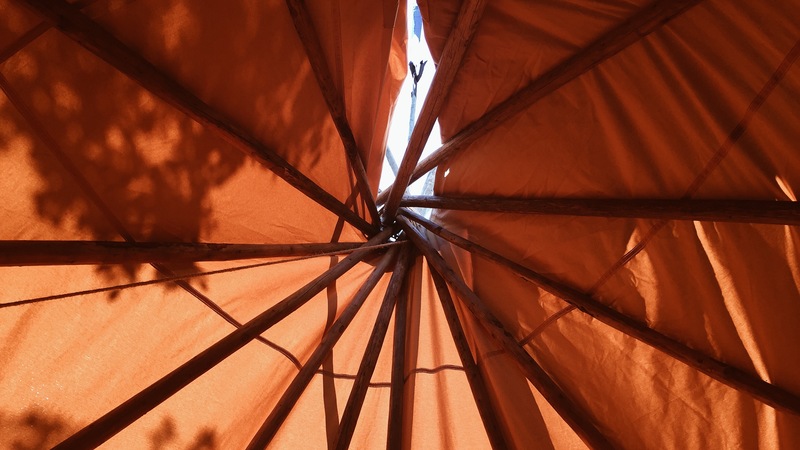 2nd Annual Lakota Language Camp continues to inspire. 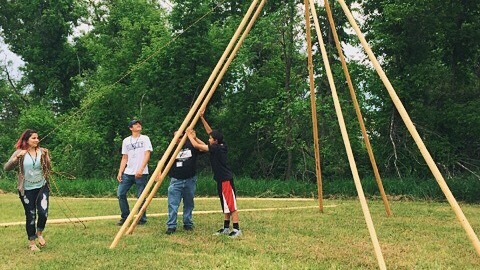 Today marks the first day of the 2nd Annual Lakȟól’iya Wičhóthi (Lakota Language Camp). There were spots for thirteen students this year and all are full - with a waiting list! The camp also welcomes RCIS Summer School Students to participate as they finish their classes for the day! The Lakȟól’iya Wičhóthi is spoken and taught almost entirely in Lakȟóta for the students to be fully immersed in the language. The students engaged in traditional activities this morning to gain a further understanding of what life was like for Lakȟóta ancestors. One of the incredible lessons they learned today was about different traditional foods and the process of making them. The students gathered in a circle to watch Evaleen Brave Heart and Velma Killsback, members of the community, show them the different foods and how to say them in Lakȟóta. 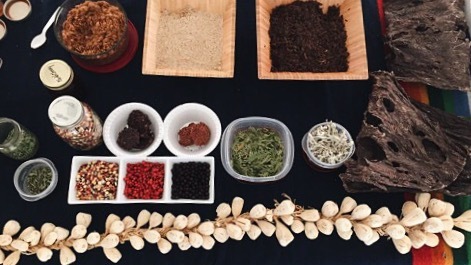 A few of the foods consisted of wagmíza (corn), čheyáka (mint), pápa (meat), thíŋpsiŋla (turnip) and čhaŋpȟá (chokecherries). The students were able to drink čheyáka tea and eat wasná (ground meat). Through these activities the students eagerly learned new vocabulary words. After their snack they sat down to cut buffalo meat. Talon Mesteth (10th grade) was very excited about learning how to make pápa kablápi (dried meat). 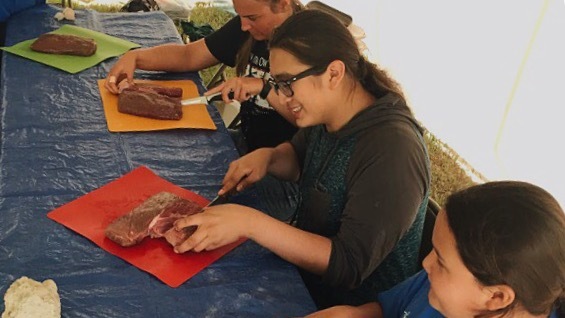 “My favorite activity of the day was cutting up the tȟaló (meat). I also learned a lot of new words from Waniya Locke about different traditional foods.” They had fun hanging the pápa on wooden posts to dry for the next four days. Other activities of the day included learning how to set up a thípi and learning new vocabulary words through games. “I learned how to say different emotions in Lakȟóta - such as wimásteste, which means 'being shy',” said Elizabeth Cabrera (9th grade). “Learning vocabulary words was my favorite part!” she added. 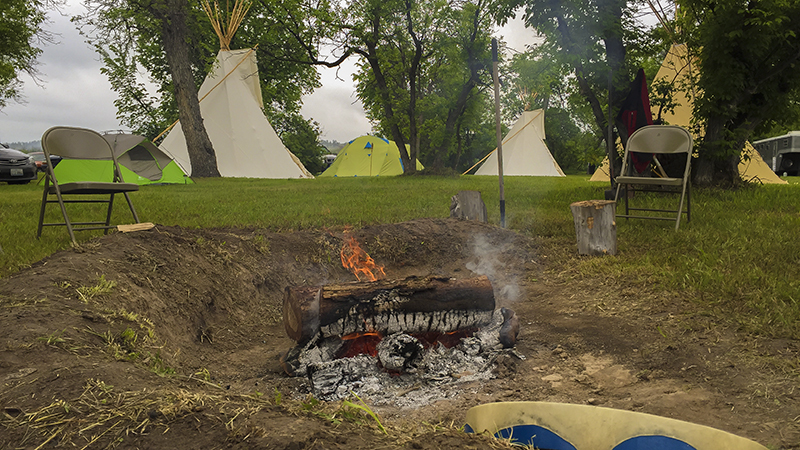 It was a fun, long, cloudy and rainy first day for the Lakȟóta Language campers. 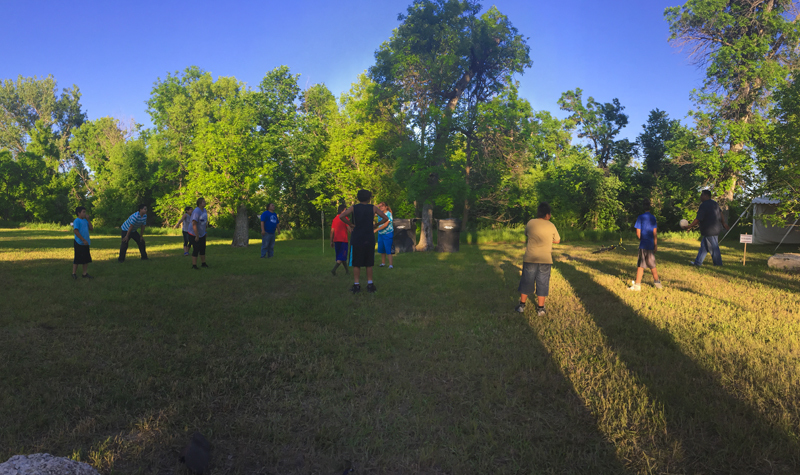 Tonight they will relax and gather around the campfire to listen to ancient stories passed down for generations amongst the Lakȟóta oyate. Continue scrolling for more daily blogs! The sun was nowhere in sight as clouds blanketed the sky. This worked out perfectly because the students had the opportunity to sit under the large canopy to create some phenomenal beadwork. 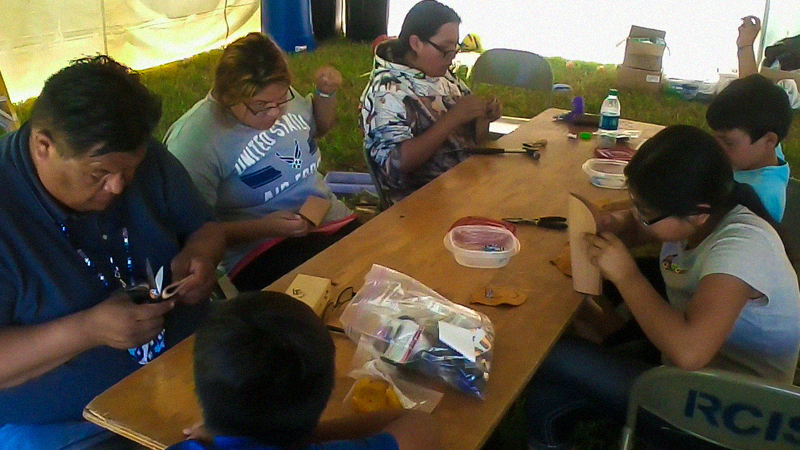 Nicky Belle, materials developer for the Lakota Language Project, showed the campers examples of the proper way to create pouches and how to bead them. Wakšúpi (beadwork) has always been an important skill for Lakȟota people to know in order to decorate our belongings and express our stories through design. The students excitedly grabbed their iyúšla (scissors) to cut the hide and picked out different colored pšitȟó (beads) to get started. Each student was able to cut the hide and sew it together. They were also shown examples of traditional geometric designs, and were then free to bead how they pleased. This allowed them to think creatively and create a sacred object unique to their personality. Paisley Sierra (8th grade), loved this activity, “I’ve been learning so many Lakȟota words! 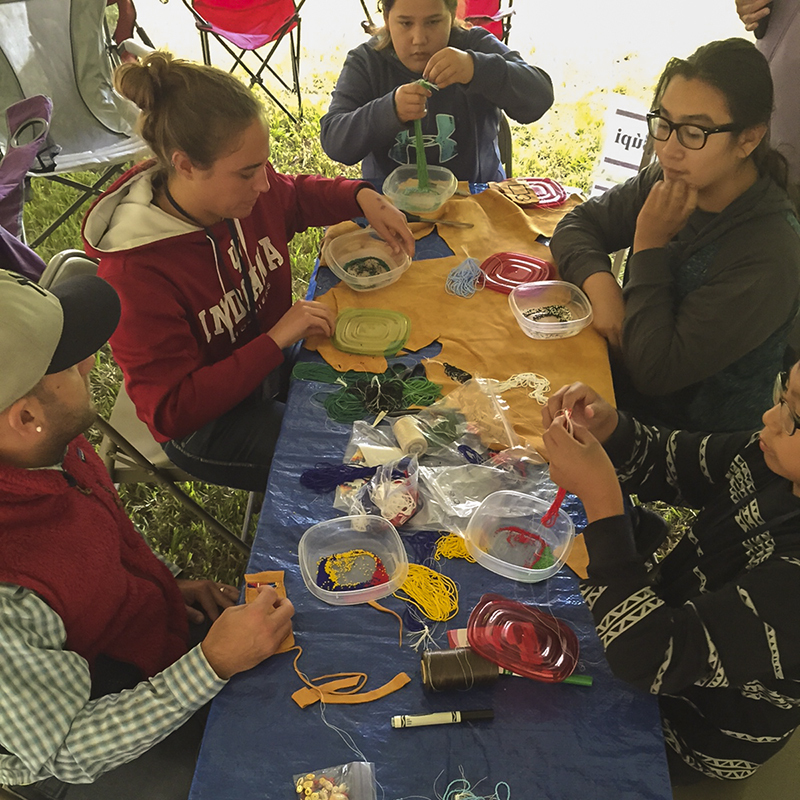 I really like the beading station because I have always loved to bead.” Afterwards, the students were eager to show their work and proudly wore the pouches around their necks. 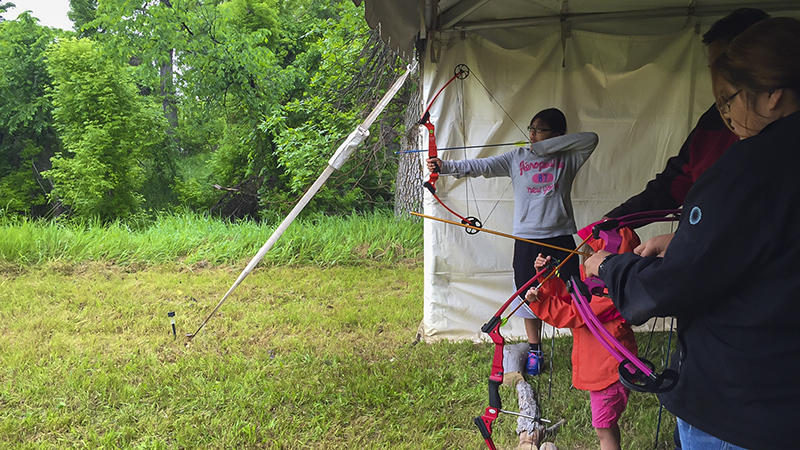 While some students were beading, others learned about archery and ultimately tried it themselves. They were also taught more in-depth knowledge about the thípi and how to build one by making a small model replica of one. They alternated throughout the day, taking breaks and continuing to express themselves through the language. The campers will then gather as one group to learn about traditional bow making this evening, taught by community member Richard Giago. And later - learn of star knowledge, a highly valued lesson from Vance Blacksmith, activities coordinator for the Lakota Language Project. Campers will end the night looking to the sky and listening to the many stories from the stars. Continue scrolling to find out what the campers learn at Wind Cave! 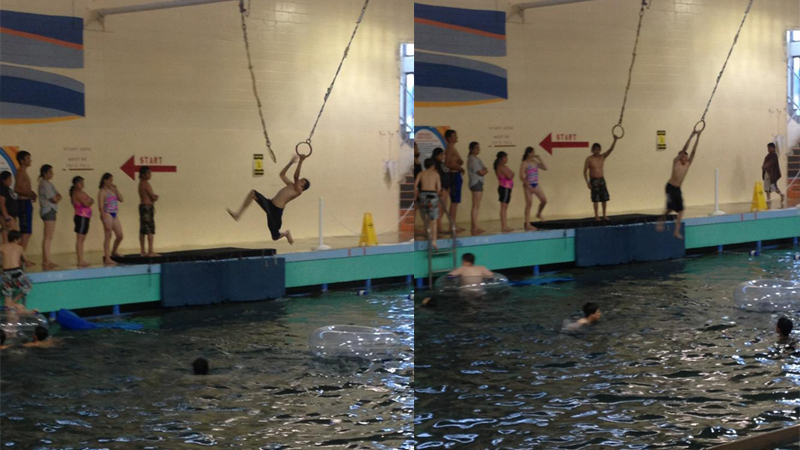 Today was an incredibly exciting day for our campers: Field Trip Day! The whole crew took a trip to Wind Cave, the place of origin of the Lakȟota people, located in the Pahá Sápa (Black Hills). 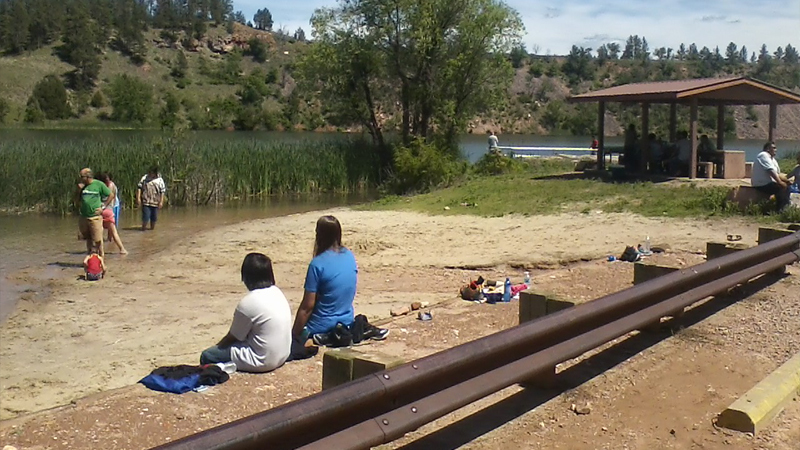 The students hiked the Black Hills and explored the Cave. While there, they heard the creation story of their ancestors from Sina Bear Eagle, a Red Cloud alumna and current Black Hills Ranger, as it was told to her by late spiritual leader Wilmer Mesteth. It worked out to be great weather for a walk through the Black Hills. After their hike, they spent their lunchtime at Colebrook Park in Hot Springs eating freshly grilled buffalo burgers. What’s a great way to cool off after a vigorous hike in the Hills? A dip in Evan’s Plunge, of course! The Plunge is a spring-fed, indoor water park, also located in Hot Springs. The original name for the Hot Springs area was Mnikȟáta, which means "warm water." The water at Evans Plunge is 87 degrees year-round and great for an afternoon swim. Once the campers return to their thípis this evening, they’ll spark the campfire once again and strike up a round of háŋpapȟečhuŋpi (handgames), a traditional activity Lakȟota children have played for many years. This has been known as one of the most popular activities of the camp because rather than using bones as part of the game, they will be using GLOW sticks! They will light up the camp and sing Lakȟota songs late into the night. Tomorrow night is the Community Night Dance! After their busy day exploring Pahá Sápa (Black Hills) yesterday, the campers were able to relax a bit while making miyožuha (knife sheaths). In historic times, a knife sheath played a very practical role. However, Lakȟota men and women often took the time to adorn the sheath with beads, paints and horse hair. 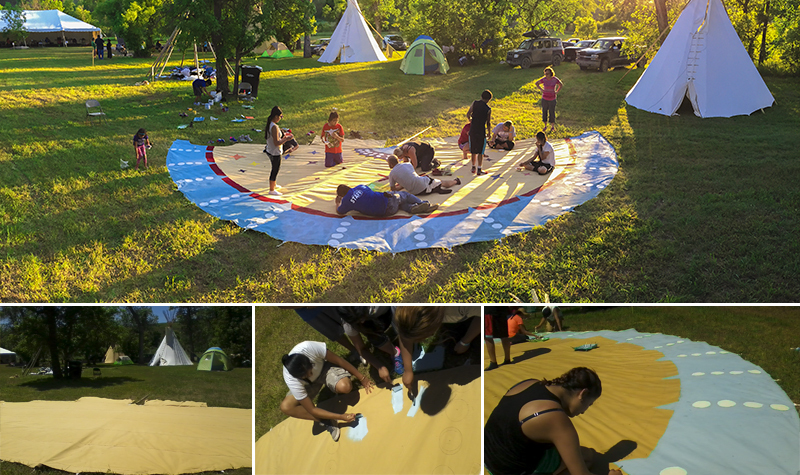 The campers were split into their three thiyóšpaye (families) groups once again (waŋblí, matȟó, heȟáka) and took turns cutting the rawhide as a first step to their sheath creation. Other activities on their final day at camp included a nature walk to identify and learn uses of native plants and animals. The students searched through the hills for things such as kimímela (butterfly), íŋyan (rock), wanáȟča (flower), pȟežíȟota (sage) and much more! They also had the privilege to paint one of the thípi donated to the Lakota Language Project (LLP) by a generous group from Sweden. 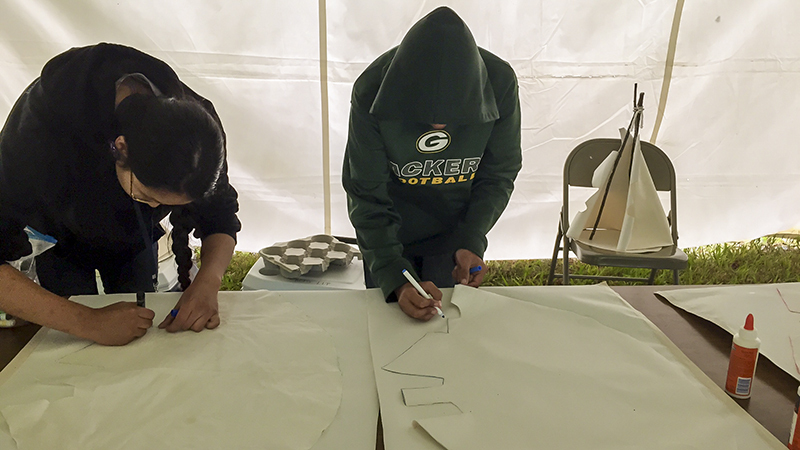 Nicky Belle, materials developer for the LLP, drew sketches of traditional geometric designs and the campers were able to paint and fill in the sketches with any colors they wanted. It was a day filled with arts, crafts and games for the students. Cante T’inza, a local drum group lead by Red Cloud Indian School’s Executive Vice President Bob Brave Heart, visited for the night and sang songs for the campers and community to participate in traditional dances. All night they celebrated, played handgames and danced the rabbit dance, owl dance, snake dance and finished with a round dance. It was a humble conclusion to an immersive four day expereince. As the camp came to a close the next morning, the students were able to bring home objects they made as mementos and a certificates to show their families and friends what they learned and experienced. Check out the camp recap!